This was once the home of the tenor Francesco Marconi, but history enthusiasts will no doubt be most impressed by its sheer age: parts of the structure are reputed to date from as far back as the thirteenth century. Indeed, the present building stands on top of the ruins of an even older Roman villa. Located to the north of Rome, this offers an attractive five star option for those preferring accommodation in more rural surroundings. 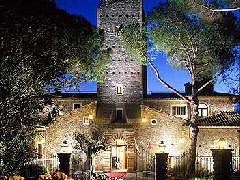 Possessing just 23 guest rooms, Castello della Castelluccia is certainly one of the more intimate hotels in the Rome area despite being set within a large country house. The hotel’s restaurant has a medieval ambience and specializes in regional cuisine. Although most who stay here will aim to explore the sights of Rome (the city is little more than half an hour away by car), others will no doubt make the most of what the hotel offers in the way of relaxation: an outdoor swimming pool open during the warmer months and a spa await.